For busy healthcare professionals who spend most of their time focused on cures, diagnoses, medical innovations, and the latest technology, it can seem overwhelming to create a social media marketing strategy. In fact, many healthcare brands believe that it’s unnecessary. But today, healthcare marketers can’t afford to ignore social media because it allows them to increase their campaign awareness, gain community support, and garner insight from a like-minded community of professionals and individuals. For healthcare brands, a social media marketing strategy must revolve around the brand while still engaging audiences enough to constantly hold their attention. 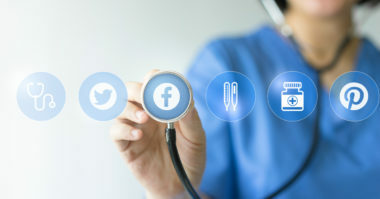 Skyword.com shared how some healthcare brands have been able to develop and maintain a healthy social media marketing strategy. This nonprofit academic medical center integrates multiple medical specialties with comprehensive hospital care, clinical trials, education, and research. Even with such a wide focus, they manage to maintain a strong social media presence on Facebook, Instagram, Pinterest, Twitter, YouTube, and LinkedIn. And they have created a friendly, welcoming, knowledgeable, and community-centric personality in a few interesting ways. These include featuring sincere and approachable photography, along with posts about local interests, and friendly stories from its blog that answer common questions. As a result, Cleveland Clinic is placing a local focus and the needs of its audience at the heart of its social media marketing strategy. All of these efforts have earned Cleveland Clinic an engaged social community on many different platforms. This Fortune 500 company provides a wide variety of health-oriented services, such as diagnostic testing, healthcare IT, clinical trials, wellness guidance, and risk management. To complement its full-featured website, which speaks to both B2C and B2B audiences, Quest Diagnostics has managed to maintain a solid social media presence across many platforms. The company features a special social media section on its website, with links that enable visitors to directly connect with the brand on Facebook, LinkedIn, Instagram, and Twitter. All of Quest Diagnostics’ social media accounts reflect the company’s professional, yet approachable, tone through their simple, warm, supportive language that helps audiences feel like members of the social community. They also spotlight their employees, which humanizes the clinical brand. This health-centric segment of the larger Philips healthcare and technology brand is focused on creating a better future through its wellness-related products and services. This mission is reflected in their social media marketing strategy that features an array of content based on its advances in healthcare and technology. For instance, their LinkedIn page includes a special “Innovations in Health” section comprised of a select community of healthcare professionals, which speaks to an audience interested in the latest healthcare solutions. This has resulted in an exclusive community with a passion for healthcare and technological innovation at both the professional and consumer level. This community ultimately provides Philips Healthcare with an abundance of insight and knowledge that can be used for future innovation. The company has been leading the way for healthcare brands in social media marketing by establishing its own unique social tone. Rather than merely posting and tweeting about their latest news, the brand is creating and sharing content with a more comprehensive focus. This strategy shows that the healthcare brand understands its audience and their interests enough to develop and endorse content that’s both relevant and timely. It allows them to deeply engage their social following and keep them returning for more. This not-for-profit healthcare network includes a world-known cancer center, top community hospitals, and smaller specialty hospitals. Even with such a professional clinical focus, they’ve established a social personality that feels upbeat, warm, and personal. Their social media posts span a wide range of initiatives and interests, such as informational stories about better well-being, adorable photos of therapy dogs, and the latest local news. And every post displays their strong passion for their people. Orlando Health manages to overcome the challenge of creating a friendly and fun social media personality for a serious healthcare brand. They achieve this by incorporating a holistic wellness approach with a focus on the needs of both the individual and the larger community. Treat your audience and your healthcare brand to a strong social media presence. Contact MDG Advertising.